I like venison steaks fried. They are yummy. I'm not wild about the baked. 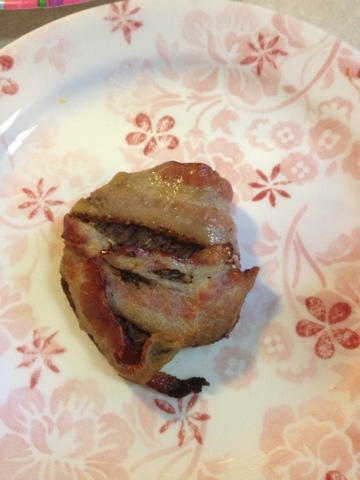 However if you take a venison steak and wrap that puppy in bacon and bake it. We are talking SHAZAM!!!! I enjoy salmon. It's quite good. Lots of Omega Fatty Acids. But wrap that salmon filet in bacon! Ohhhh yes! Drench it all in Alfredo sauce! Then. Just sit back and enjoy your Atkins friendly dinner! I'm not going to post on more than one blog about my various interests. There just isn't that much extra time in my life. So here comes a diet post! The hubby and I just started the Atkins diet. We both have a good chunk of weight to lose. I've been reading the 1991 book by Dr. Atkins himself and while it is probably a little outdated in the most recent scientific research, I started reading this one and loved his kind but firm style of convincing you to do the diet. He simultaneously makes you feel less guilty about your weight problem while still making it clear that you have to make changes. Now I'll be honest, I was REALLY skeptical about even trying it. I LOVE bread and well you have probably seen my cake posts. It's really not as bad as I thought it would be. I've been taking the L Glutamine supplements he recommends for cravings, and I think they really help.